No other company knows how to stretch out a franchise quite like Disney. Once something has proven to be popular, they will move that property through as many mediums as possible. While they have been doing this forever, the modern face of this began in 1994 when the Aladdin sequel The Return of Jafar went directly to video. This spawned a slew of direct-to-video movies and television series based on Disney theatrical films. Disney then branched out to Broadway with The Lion King, Beauty and the Beast, and Aladdin. Now, The Lion King, has come back to the home video realm, as we get The Lion Guard: Return of the Roar, a made-for-TV movie which serves as a pilot for a new television series. 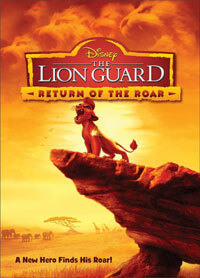 The Lion Guard: Return of the Roar begins some time after the conclusion of The Lion King. Simba (voiced by Rob Lowe) and Nala (voiced by Gabrielle Union) oversee the pride and the Pride Lands, and, more importantly, their children, Kion (voiced by Max Charles) and Kiara (Eden Riegel). Kion is a scamp who loves playing with his best friend, Bunga (voiced by Joshua Rush), a honey badger. During a run-in with some hyenas, Kion discovers that he has a very powerful roar. He learns from Rafiki (voiced by Khary Payton), that he has inherited the power which makes him the leader of The Lion Guard, a group which protects the Pride Lands. Simba confirms this and tells Kion to assemble a group to inform his team. But, instead of recruiting other lions, Kino puts together a team based on their skills -- Bunga for his bravery; Fuli (voiced by Diamond White) the cheetah, for speed; Beshte (voiced by Dusan Brown) the hippopotamus, for strength; and Ono (voiced by Atticus Shaffer) the egret, for keen sight. Together, this odd group forms The Lion Guard. When I watch a movie or TV show, I try to imagine the thinking behind it and how it was created. While watching The Lion Guard: Return of the Roar, I envisioned a group of Disney writers saying, "OK, the top brass wants us to bring back The Lion King in some way. Hey, Disney has made a lot of money off of The Avengers. Why don't we put a super-hero team into The Lion King?" I could be completely off on this, but that's exactly what The Lion Guard: Return of the Roar feels like. This idea both brings new blood to the franchise, but also flies in the face of what we've seen before. In the previous stories in the series, it was made clear that the lions and the hyenas, were the only powerful animals in the region. Other animals either actively avoided fighting, or were simply background players. Now, we have a diverse group of animals who will presumably be involved in all sorts of action. This opens up the world of The Lion King, allowing for the inclusion of more characters, and it also sends a positive message about diversity. This is positive news, but, overall, things don't look very good for The Lion Guard: Return of the Roar. Again, this 44-minute movie serves as a pilot for The Lion Guard television series and it feels every bit like a pilot. The piece assumes that we are familiar with The Lion King mythos, so it skips over any true backstory and jumps right into introducing us to Kion and Bung. Kion is just a young Simba clone, so he's fine, but Bunga, who is supposed to be the fun-loving side-kick, is annoying from the outset. Bunga is given a catch-phrase -- "Zuka Zama" -- and a song which goes with it. Both of these will drive most adults from the room. After the segment in which Kion and Bunga accidentally tread into hyena territory (didn't we see this in The Lion King? ), the story then goes through the paces of introducing The Lion Guard story. It's only in the last few minutes that Kion puts together his team and we meet the other members of The Lion Guard. In an odd way, the whole thing feels both leisurely paced and very rushed at the same time. The big question here is, being a pilot, did The Lion Guard: Return of the Roar make me want to become a regular viewer of the series? I fully realize that I'm not the target audience here, but the answer for me is no. If the pilot's job was to introduce intriguing characters and ideas which would hook the viewer, then I say that it failed. It doesn't take an Oscar-winning screenwriter to predict that each week The Lion Guard will be faced with a new challenge and that one member's special ability will be the answer to said challenge in a given episode. The creation of a super-team (each of whom gets a special mark) in the world of The Lion King simply feels forced and the lack of charm amongst these new characters isn't appealing, even with old favorites in supporting roles. The Lion Guard: Return of the Roar did show me that animals in Africa like to play a version of American football on DVD courtesy of Walt Disney Studios Home Entertainment. The film has been letterboxed at 1.78:1 and the transfer is enhanced for 16 x 9 TVs. The image is very sharp and clear, showing no grain and no defects from the source materials. The colors look fantastic and the image is never overly dark or bright. The level of detail is very good and there is a nice amount of depth for a DVD. The DVD carries a Dolby Digital 5.1 audio track which provides clear dialogue and sound effects. The songs in the movie sound fine and fill the speakers. The stereo effects show good separation and there are a few distinct surround sound effects. The action sequences provide mild subwoofer effects. The lone extra feature on The Lion Guard: Return of the Roar DVD is a MUSIC VIDEO for the song "Here Comes the Lion Guard" performed by Beau Black, who, for once, isn't a Disney actor being shoved into a musical role.